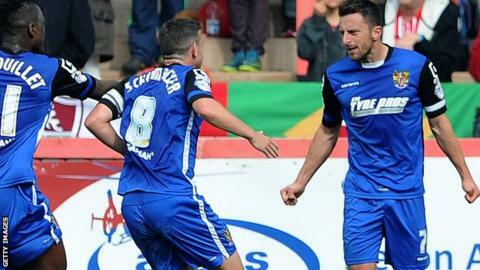 Chris Whelpdale struck a stoppage time volley as Stevenage twice came from behind to draw against Exeter. David Wheeler looked to have won it for the hosts with an unstoppable right-foot strike late in the second half. Wheeler had earlier headed Exeter into a fourth-minute lead from a Lee Holmes cross before Clinton Morrison doubled the advantage with an overhead kick. But Stevenage responded and were level by half-time thanks to Dean Parrett's free-kick and Ben Kennedy's header. David Noble's diagonal ball found Wheeler in the area as he lashed in what appeared to be the winner for Paul Tisdale's side only for Whelpdale to upstage him. The midfielder flashed a right-foot strike past Bobby Olejnik in the Exeter goal after substitute Brett Williams' flick-on found him unmarked from 12 yards out. Match ends, Exeter City 3, Stevenage 3. Second Half ends, Exeter City 3, Stevenage 3. Corner, Stevenage. Conceded by Christian Ribeiro. Brett Williams (Stevenage) wins a free kick on the right wing. Goal! Exeter City 3, Stevenage 3. Chris Whelpdale (Stevenage) right footed shot from the left side of the box to the top right corner. Assisted by Brett Williams. Attempt missed. Dean Parrett (Stevenage) right footed shot from outside the box is just a bit too high. Substitution, Exeter City. Jordan Tillson replaces Jamie McAllister. Substitution, Stevenage. Tom Pett replaces Ben Kennedy. Substitution, Stevenage. Brett Williams replaces Tom Conlon. Tom Conlon (Stevenage) hits the right post with a right footed shot from outside the box from a direct free kick. Goal! Exeter City 3, Stevenage 2. David Wheeler (Exeter City) right footed shot from the right side of the box to the top left corner. Assisted by David Noble. Attempt missed. Troy Brown (Exeter City) header from the centre of the box is just a bit too high. Corner, Exeter City. Conceded by Mark Hughes. Substitution, Exeter City. Arron Davies replaces Matt Oakley. Corner, Stevenage. Conceded by Matt Oakley. Substitution, Exeter City. Tom Nichols replaces Clinton Morrison. Fraser Franks (Stevenage) wins a free kick in the attacking half. Attempt blocked. Joel Grant (Exeter City) right footed shot from the left side of the six yard box is blocked.